It’s been a rough week at work, too much going on and too few folks to do it. Critical resources AWOL. You get the drift, yah? Welcome to the Indian software industry. 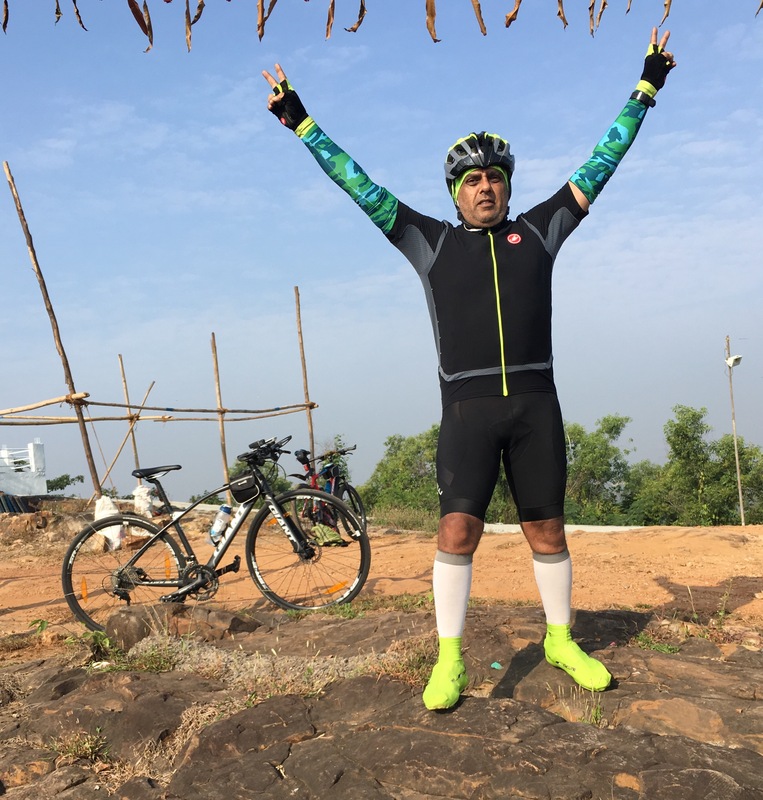 A welcome diversion comes in the form of the young cyclist, Niranjan. 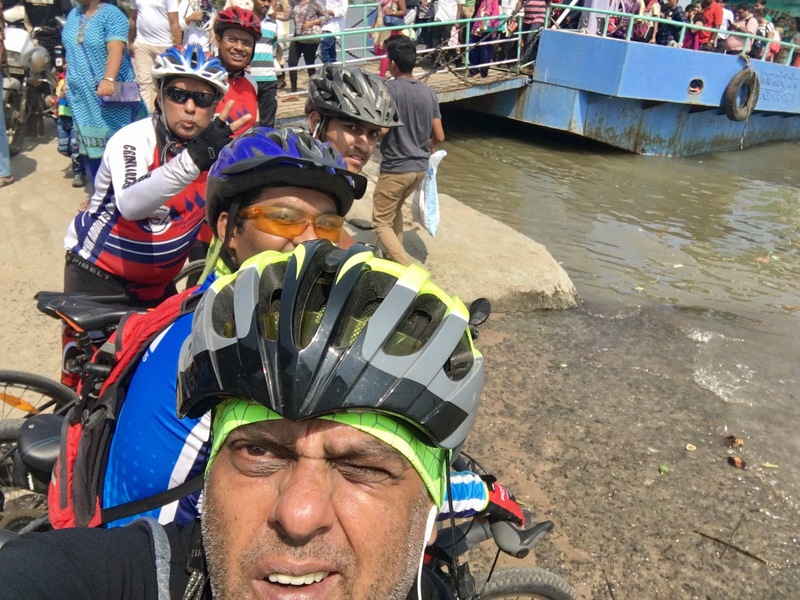 Bump into him at Pro9 and he goes, we are looking to do a ride that takes us around the periphery of Bombay. Have bike – will ride. Always. Sure I want to ride, but there is this little thing called travel on the cards, so it’s a bit iffy. Carl messages day before the ride as well, please join, it’s fun riding with you and I guess that felt nice. A bit aghast seeing that they be looking to leave at 3 am. It’s not daunting that it’s the witching hour, but rather, it’s not that long a ride, let’s leave later. See it’s the sun and heat that’s the concern (not me I like riding in the heat), so I defer and go with the plan. Perhaps I should say I don’t like riding in the rain, just so I don’t let the public get the impression that I ride 24*7. Oh well, I do ride 24*7 oftentimes starting late at night, but just don’t like the rain. Now that we have that little item settled…. Now I’ve done this particular ride at least a couple of times before, but given the circs, this is manna from heaven. Had to rush to office for a video conference and got done pretty late. So with little or no sleep, start prepping for the ride at 2.15 am. Gear check, bike check, and man and machine all set to roll. Make the rendezvous point (Shivaji Park) no one there, so ride around for a few minutes and the pack arrives. Arvind, Carl, Niranjan, Vidit. Discuss distance (140 km appx), pace (should average 22 kph), and we are off. First stop NCPA, hydrate, pics, kid around. Selfies not preferred, but will have to make do, no one around to take our pics, except some couples on the sea face whom we decide not to disturb. 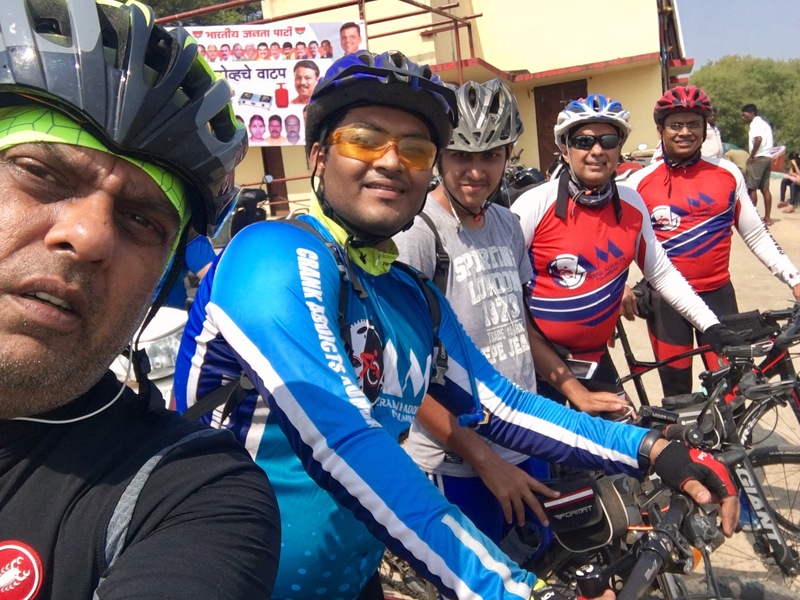 First Stop – NCPA: L-R: Vidit, Doc, Ninja, Sumir, Carl. 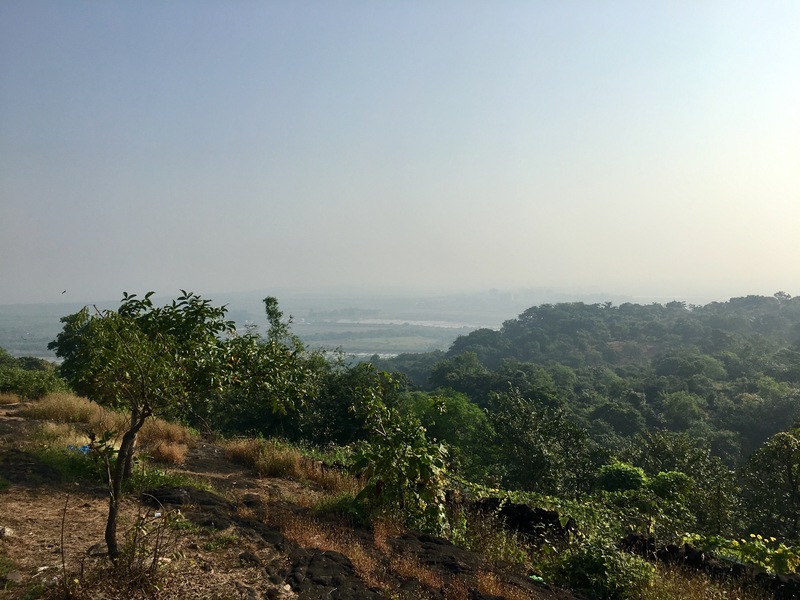 The next leg is NCPA to the Eastern Freeway that connects downtown Bombay to the hinterland and also connects to the Eastern Express Highway. 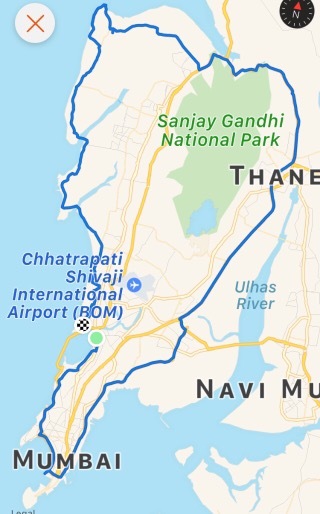 Good pace on the Freeway, and in almost no time we are connected with the said Expressway and a very short while later we are at the checkpost demarking Bombay from Thane. We take a pit stop and hydrate, get some morning tea and onto the next leg. Doc breaks out the super “Brown Salt” brand goodybag, with roasted nuts and cookies. Now Brown Salt is his lovely daughters’ brand, and the stuff is good. Breakfast point is decided as Bhayendar or Utan, but as luck would have it, the young lads Niranjan and Vidit get separated. A couple of calls and we decide to regroup at Decathelon on Ghodbunder. Since we did stop, well we did make a stop of it and got some more chai and did a quick snack too! More Brown Salt goodies (of course). I sure hope he’s paying the kid for the stuff he’s stolen! But we did loose time and are resolute to make up by a much shorter breakfast stop, which didn’t happen. Sorry, breakfast stop did happen, but was leisurely. Thanks to me. Was just keeping the rescheduled breakfast stop suspense. 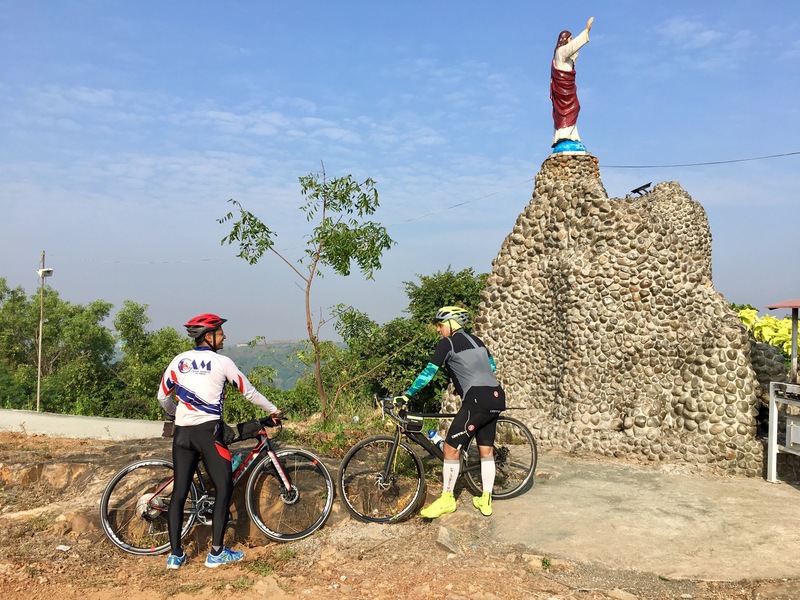 The ride up Ghodbunder was nice and the downhill was super. We ride different paces, so decide to make Fountain at the end of Ghodbunder our reassembly point, before we get to the turnoff to Utan. Up until this point despite our stops etc we are averaging 25 kph or so. Not bad, not bad at all. We have covered about 90 odd km till then I think. 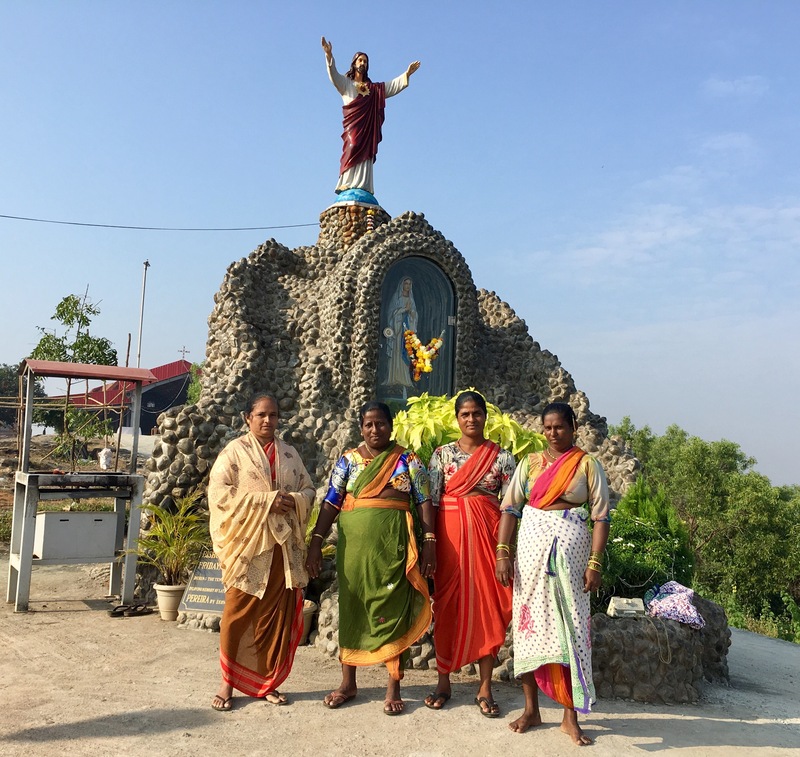 Crack on and we are at Utan and we climb up to the chapel atop a really steep incline. This one is new to me despite me being a self proclaimed authority on Utan rides. Well, ran out of wind and the gears really slipped a lot so ended up walking up the final slope. But the climb/walk is really worth it. It’s beautiful up there. Thanks Carl. I will have to do this again, and make the summit, this time without dismounting. So now we roll down and soon we are a’climbing again, this time up the slope into the fishing village of Utan. Now this is where I spring a surprise on the guys and say at some point turn left. Now that left leads up a slope that kinda says, you da gonna go to heaven! Doing that incline after a 100 km ride is not to be taken lightly. That surprise left leads to a place called Hotel U-Tan Sea Resort. A well kept secret. Beautiful little villas, pool, deck based dining area showing off the Utan coast in all its glory. And this the decidedly short break turns out to be a really long one. Albeit one well worth it. Discovery for the boys. Now I’m forgetting what time exactly we descended from the “Road to Heaven” but methinks it must have been around 11 am or so. The next leg takes up down to the town market place and the view is really nice. It shows fishing vessels anchored off the coast. It always brings to my mind the scene from the movie Troy. 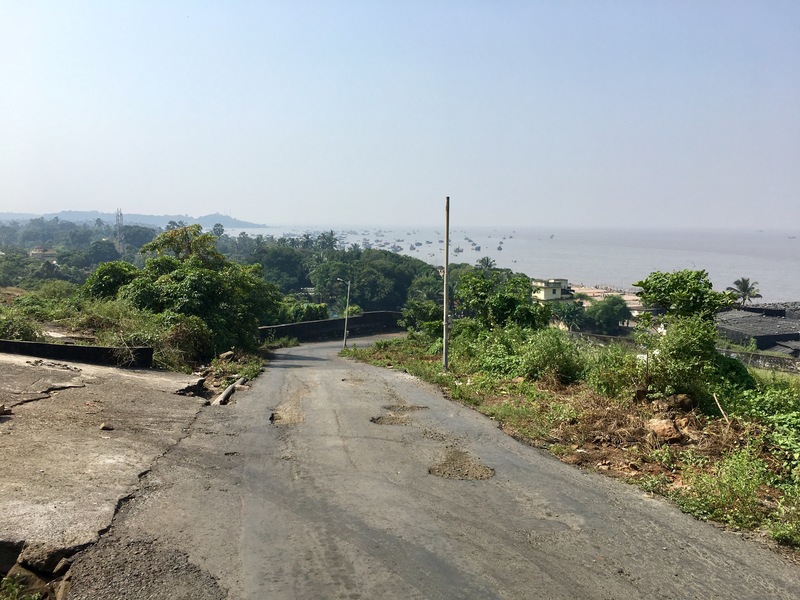 A final climb and that brings us to the stretch running through the Gorai beach stretch, and at the end of that comes the fork in the road. 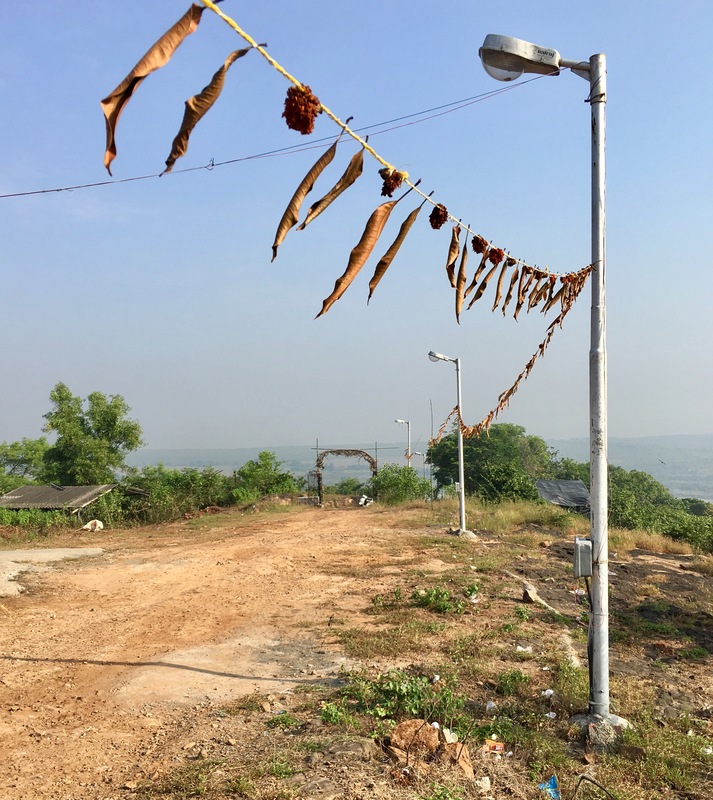 One leading to Esselworld and the huge Buddhist Pagoda, with the bright gold stupa, and the other, leading our way. The stretch to the jetty at Manori. Gorai and Manori bring two things to mind. The Manori Belle I was seeing a long time ago. And targolas, those juicy things found inside a coconut like shell. Targolas we find at the jetty and do I have to really say that we dug in, what with the good Doctor wanting to take a closer look, ensuring that we are given only the juiciest of the lot. Give us the juiciest ones please, or else…. Feasting on these only meant that we let a couple of ferries go, but finally hop on for a five minute ride to the other side, which is the Marve stretch. Ow The Sun Hurts My Eyes! 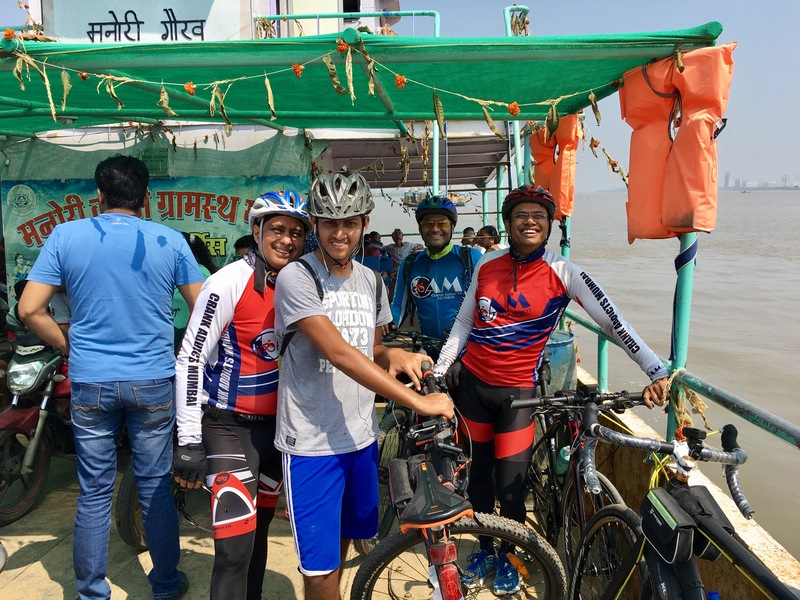 The short ride brings us to the leg that ends at yet another jetty at Marve, and a two minute ride later we are at the fishing village at Versova. The sprawling city of Bombay is after all made up of seven islands joined together and created on the basis of humongous land fills. 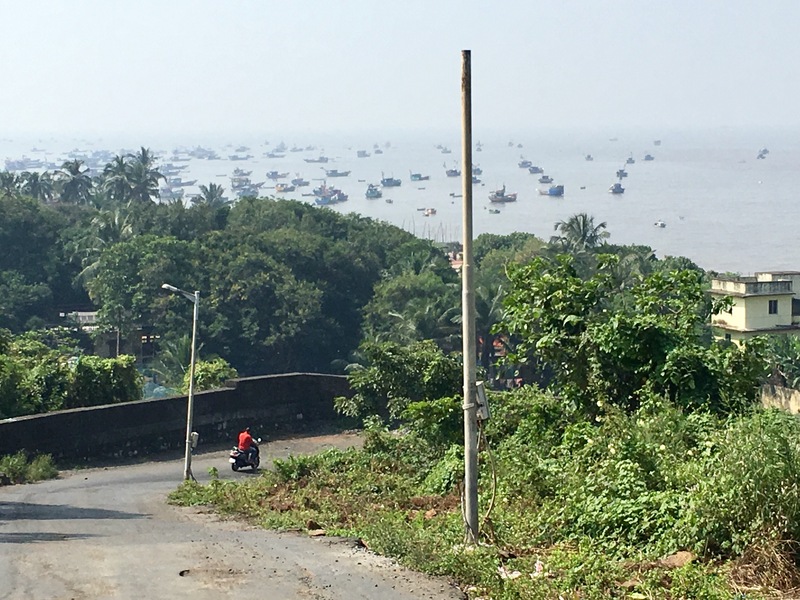 In effect Bombay is just on huge fishing village turned into a major and immensely populated metropolis. Now this is where we are back in civilization, it’s around 12 noon, and realizations dawn. Dammn it’s hot, it’s crowded and by the way our little getaway is over. Welcome to the real world. At Juhu Circle we part ways. I head straight to Bandra via Juhu Beach and the others turn left. Carl to Kalina, Vidit and Niranjan to Vile Parle and Dr to Wadala. What a super ride, fantastic company, a few stops too many, but loads of fun anyway. 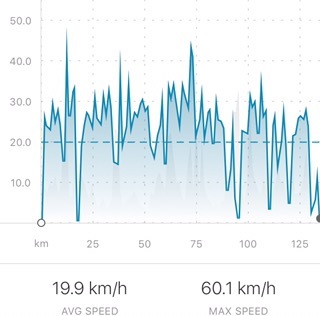 A total distance of 134.7 odd km (read 140 odd, started Strava late) a top speed of 60.1 kph, calories burned 3551 (probably more). Nicely written. Great pics n description. You’re comments are valued and welcome. Really loved the description. Felt almost as I was there riding with you guys. Hope I can join you guys soon! Nice one Sumir! Fab! This is one of those which makes one think – ‘wish i was there’! Got a fresh bike fit yesterday from Firdaus bhai… lots of issues sorted. Should be riding around a 100 soon. Let’s do this again in November?! Fabulous! Got a lot of issues fixed yesterday with Firdaus bhai doing a fresh bike fit. So hope to do a 100 again soon. Let’s plan another one in November?